The team of Boeing (NYSE: BA) and Lockheed Martin (NYSE: LMT) has filed a protest against the U.S. Air Force‘s award of the multibillion dollar Long Range Strike Bomber contract to Northrop Grumman (NYSE: NOC) nearly a week after a post-selection debrief. Boeing said in a statement issued Friday they took issue with the Air Force’s evaluations of costs in both teams’ proposals and that the company called “relative or comparative risks” of each proposal. 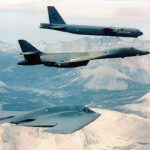 The Air Force values the bomber program’s engineering and development phase at $23.54 billion in 2016 dollars and the total program cost of at least $50 billion, also in 2016 figures, if the branch buys the maximum 100 planes. The Government Accountability Office, a congressional agency that reviews protests of contract awards, has up to 100 days to review the Air Force’s selection and hand down a decision.